Coming Soon: The Impetuous Afflictions Blog Tour & More! Hello all! The countdown to the release of The Impetuous Afflictions of Jonathan Wolfe has started, and yes, there's a blog tour! This is my first tour and it took me a while to decide whether I was going to do one or not, but then I decided it might be nice for folks to get to know the fellas a bit before reading the book. After all, there's a whole new generation of Brats now. Some fabulous folks have been wonderfully generous, allowing me to drop by their blog during my tour. It's thirteen stops with three prizes up for grabs. The best part is, I made the fellas do the whole thing. Yep, I'm quite evil. The first six stops are hosted by the man himself: Johnnie--who of course had a few words to say on the matter, and the remaining seven stops will be hosted by the Brats, who will tell you a little about themselves and each other. During the tour, you'll also get serialized excerpts, and by the end of the tour, the whole of Chapter 2 will have been posted. Chapter 1 you'll be able to get from either my website or from the Dreamspinner site on the 8th of November. So that's 2 free chapters. And those of you familiar with my writing, you know my chapters aren't short. The tour starts on November 9th over at The Novel Approach and ends on November 26th over at Mrs. Conduit & Friends. Folks will have until the 1st of December to enter and it's easy peasy. Just leave a comment on any of the posts along the tour. You can even enter by email at (charlie@charliecochet.com). On November 6th is my day over at The Romance Review's Year End Splash. 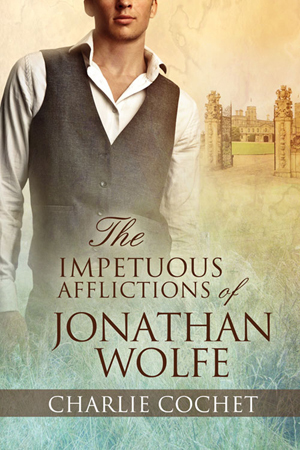 You can enter to win an ebook copy of The Impetuous Afflictions of Jonathan Wolfe. Then on November 23rd, you'll have another chance to win a prize at my Facebook chat over at the Dreamspinner Facebook page. Post GRL2013 and What Comes Next? Hello all! Sadly, GayRomLit 2013 has come and gone already. Since I went as a general attendee, I got to relax a little and didn't have to worry about swag or panels, though next year I'm really hoping to register as an author. I had so much fun. The writers' workshop was fantastic, not just because of the classes, but because it allowed you the opportunity to spend some time with your fellow authors before the big event. I had such a great time seeing folks I'd met the previous year, plus I got to meet loads of new folks this year, many of whom I'd chatted with online but hadn't met in person yet. The themed events were awesome, and the photo booth was a genius idea. I didn't take pictures because I know myself. I get swept up in the people and events and just forget, but there are LOADS of pictures on Facebook, so if you go to my Facebook page you'll see me tagged in lots of them. I dressed up as a flapper for the masquerade (I couldn't resist). I would list all the highlights but that would make this post silly long. I could gush about GRL for ages. Again, see Facebook. So what's next? Well, GRL is obviously a great place to be to get motivated and inspired. I had several folks give me a good kick up the backside--figuratively of course, while I was there about my writing. My WIP list is massive, but I realized unless I got myself organized and scheduled, it would remain a WIP list and not a New Release list--which I'd been struggling with the last few months. I thought long and hard about what I wanted to have out next year, and what I would like to have available for GRL if I was lucky enough to get an author slot. Those of you thinking Hunter's book, he will be worked into the schedule somehow. I've worked out a schedule so you won't have to wait a year between books. In fact, if life permits, they will hopefully be released within a month or so of each other. Eventually there will be spin-offs with two other pairings, but for now we have the two MC's across four books. There are lots of exciting ideas in the works for this series because I want to go big with it. Of course, this means that my blogging will likely fall back to about once a week. The schedule is pretty tight--especially for the first book, and as I'll be pretty much concentrating on this series for the next year, it means slower releases for my other WIP titles. We'll see what I can fit in where. Busy doesn't begin to describe it. But, deadlines are good for me. It means I get the books done. There will be more info on these fellas soon, so stay tuned! I'll also be posting dates and stops for The Impetuous Afflictions Blog Tour next week! Lots of chances to win goodies coming soon! Coming November 8th!! The Impetuous Afflictions of Jonathan Wolfe. Heya everyone! Guess what?! The Impetuous Afflictions of Jonathan Wolfe is on Dreamspinner's 'Coming Soon' page and available for pre-order in eBook and paperback! I'm so very excited--as you can probably tell. I have some fun events in the works for the release so make sure to stay tuned! There will also be plenty of opportunities to win some books and exclusive swag. The release date is November 8th. Hello all! We have some great giveaways going on at the Tea House. Harry K. Malone is offering a copy of The Hollywood Event. To enter, just leave a comment on his October 11th post before Oct 19th. Winner will be chosen at random and notified by email. Hi all! Guess what I have? The amazingly talented Anne Cain has created the cover art for The Impetuous Afflictions of Jonathan Wolfe, and I have to admit when I opened my email and saw it, I gasped. I'm so in love with it! 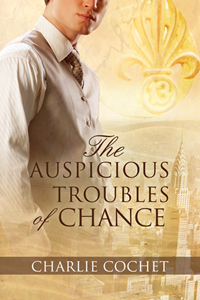 Not only do I love the colors and the fact that it matches the cover she created for The Auspicious Troubles of Chance, but the model... *fans self* absolutely perfect for Johnnie, right down to the tiny lift on the corner of his mouth that tells you he's about to get into some kind of mischief. I like that you can tell they're part of the same series without having to say so, because let's face it, the series and books have some mega long titles. Hopefully *fingers crossed* it shouldn't be too long before Johnnie appears on Dreamspinner's Coming Soon page, and pre-orders should be available at GRL. I'm super excited and equally nervous! Johnnie's book will also be my first official novel-length story and the first to be available in print! Stay tuned to this station because there will be plenty of goodies coming up for release day! Hello all! Hope you had a lovely weekend. GRL is practically upon us and I've been running around like mad trying to get everything ready, as I imagine a good deal of other folks are doing. Of course, a lot of those folks probably have way more to prepare for than I do. This year, I'm going as a general attendee since the author spots were limited, but I didn't want to miss out on the opportunity to meet up with old friends and hopefully make plenty of new ones, not to mention attend all the fab events (I've got my costume for the Heaven and Hell Masquerade Ball all set!). Since I'm going as a general attendee, I haven't had to worry about swag, but that doesn't mean I won't have some exclusive, special goodies to give away! 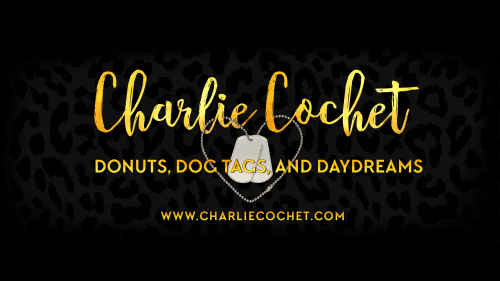 I'm taking part in the Rainbow Romance Writers scrapbooking event since I'm now a member, and we've been told we can bring some swag to give out at this time, so I'll have swag on me you won't be able to get anywhere else at GRL. There will be a limited amount, since I'll be carrying them with me, and I wan to respect the rules. Authors going as registered attendees are asked not to go around promoting themselves, which is understandable and okay with me since I'm still shy when it comes to actively talking about myself as an author and my books, but folks are encouraged to chat, so if anyone fancies coming up to me to chat, say hello, or ask a question, please do! If you don't know what I look like, just check out my facebook page and you'll see my picture on there. Chances are I'll have a flower in my hair, be dressed in either polka dots, sugar skulls, or something equally geeky. Speaking of swag, I have some fun and exciting bits coming soon as I've been preparing for the release of The Impetuous Afflictions of Jonathan Wolfe. No release date yet, but we're getting close. More to come on that this week!